looks great mate, and I think it looks good now- do you need to powdercoat it? You can see things that we can't see, but it doesn't look like it needs repainting from here. Steel frames need preserving against rust, but unless there's any threat of that the original paint is a really important asset IMO. And if you've got authentic decals, you're well away. That's a classic British retro bike, ride with pride. I see what you're saying regarding the original paint, but there is quite a substantial amount of bare metal on the non-drive side chainstay showing from heel rub and more underneath the BB shell. I could try to find a colour match and touch it up with some paint, but it'd probably be safer in the long run to strip it all back, check for any hidden problems and then have it re-coated. That way it will last at least another 20 years or so. I'm riding it in the meantime though. lovely bike. I would say that i have one also still have the force light bars on mine lol. Do you have that catalogue page in a bigger pic? I think the important thing is to Kurust all exposed metal - that will stabilise it. Bare metal isn't really a problem, though, it's bubbling that you need to be wary of because that means rust coming from the inside. If you have that, I would totally agree with you. I don't think an aftermarket powdercoat job is safe for anything like as long as 20 years though. The trouble is the steel usually isn't primed, all the paint goes on as one layer, which is very hard and stiff. So if there's any crack in the paint over the years, moisture can get in and get between the frame and the paint, causing unseen problems that can get bad before they're apparent. If the basic paint is sound, my guess is that repairing it will last at least as long as you should leave a powdercoat before re-coating. Looking awesome... I just loved the shape of the frame since I first used to sell 'em. I have brand new Saracen / San marco ti saddle Nos boxed as per the catalogue pic in this thread if you are interested?? Awesome build, looks absolutely stunning. Looking forward to seeing this in the flesh at the NWA meet this weekend. Ridden as promised at Llandegla this weekend during the NWA meet. I've got to say that I am very impressed with the way this bike rides. The short wheelbase means it's very handy on the tighter stuff and great for climbing. I haven't ridden fully rigid on anything vaguely technical for quite some time, and I'd forgotten how much fun it is. You've really got to pick the good lines and use your arms and legs to smooth your way through the rough stuff. Fortunately the handling on the Kili is very direct and precise, and the rear triangle feels lovely and compliant. I was also impressed with how much grip my 'Farmer John's Nephews' gave. All this bike really needs is a new 7spd cassette to stop the chain from occasionally skipping. All in all this is currently my favourite bike. Think that big smile on your face when riding it yesterday showed us what a success this bike is. Some people don't get on with short wheelbases, but they are such good fun to ride and as you say they're great in the tight stuff and climb like nothing else i've ever ridden. 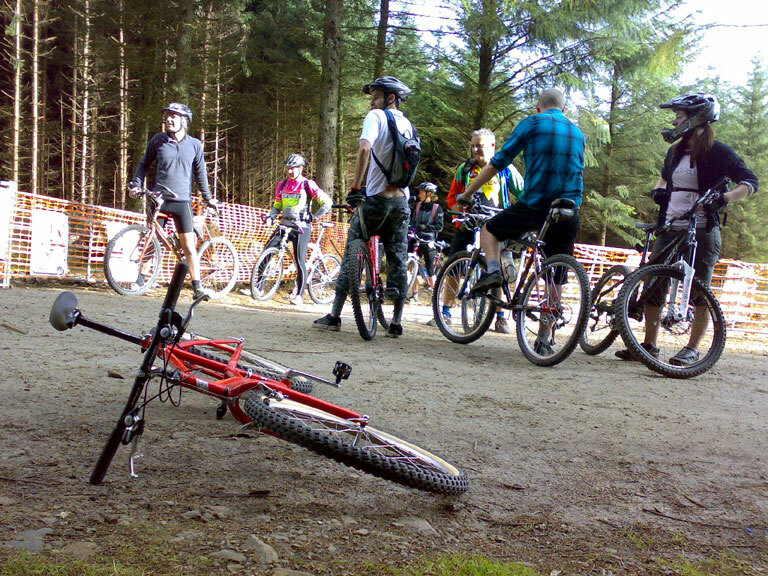 The Saracen looked immaculate to boot and got loads of attention on the trails. Oh, nice work what an inspiration. I have one also same size (18"iirc) on the back burner but the shortness was putting me off building anytime soon. Cool, well I got on ok with my super short modern so why not one of these. Tidy looking build, moar pics!! !